Update: Mad City Frites is closed. In a word: A side dish takes center stage. JM, Miranda, Nichole, Phil and the kids ate the frites with all the sauces. JM and Nichole also tried the poutine. The bill was about $5/person, plus tip. JM and Nichole both gave Mad City Frites a B (see our grading rubric). 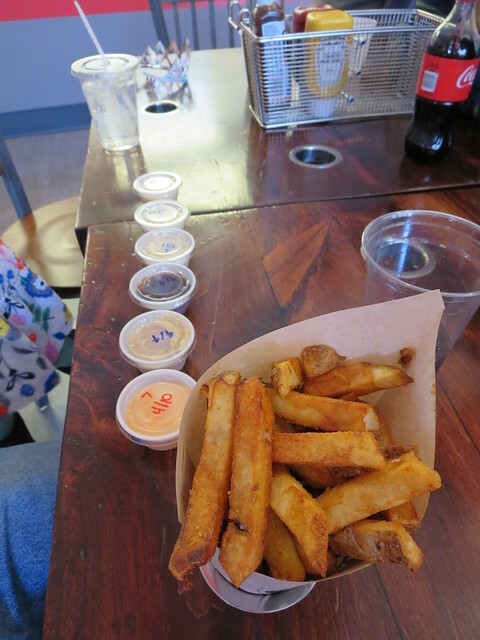 So Mad City Frites serves one thing really well: thick-cut potato fries with an array of creative sauces. They have custom-made tables and tableware to accommodate the paper cones that establish this frites shop as an earnest aspirant to Belgian-style snacking perfection. Madtown Mango: The mango hangs way back in the mix and the garlic comes through more strongly than it should. Game Day Garlic: This is fine, though a little drab. Olin Park Parm: This ended up pleasing few, since the cheese flavor is pretty subdued. Campus Queso: This is pretty nice. It is the only sauce that is served hot. Bascom Hill BBQ: A favorite of the table. BBQ sauce rarely disappoints, and this one balanced sweet and smokey well. Isthmus Honey Mustard: Another winner. Sweet with a nice mustardy finish. Definitely top-tier. Sconnie Sriracha: As with all of MCF's aioli/mayo-based sauces, this one loses a fair amount of the flavor because of the oil in the base. It did have a little heat, though. Big 10 Buffalo: Tabasco-y and a mite hotter than the prior. Still, heat enthusiasts will be disappointed. Mad Sauce: This was pretty good. A nice peppy take on sweet and sour. Camp Randall Ranch: JM still doesn't understand the obsession some people have for ranch dressing. This is a classic take on it, if a little watery. Grateful Red Pepper Aioli: Not much there there. Wunsch's Wasabi Ginger: This tasted like a cross between a sushi plate and Dijonnaise. There was little horseradish nose. Picnic Park Pesto: A decent pesto sauce, in truth. Worked better than expected on frites. The frites themselves were thick, seasoned, fluffy as promised: squishy greasy goodness. 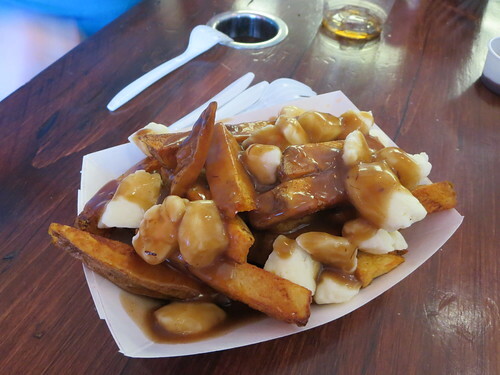 JM and Nichole also tried the poutine, fries topped with roast beef gravy and fresh white cheese curds, but honestly the fries with sauces were better - simpler, and less insanely filling. We actually like one-menu-item places (better than one-word-name places, usually) and, having tried all the sauces, we've whittled the list back to what we would get again if we go. If our descriptions don't go far enough, we recommend bringing some extra friends and trying the menu so that next time you'll know just which half to a third you should order next time.